May it never again trouble this earth. Ohio voters have rejected the ResponsibleOhio initiative, which would have created a "monopoly" on legal marijuana cultivation. More Indian tribes move toward okaying medical marijuana, a North Dakota initiative petition gets its language okayed, and more. SWAT teams killed three drug suspects this month, and a South Carolina cops will walk free after gunning down unarmed teenager Zach Hammond in July. Another week, another sticky-fingered cop, another cop protecting dealers, and another jailer smuggling dope. LEAP endorses Ohio's Issue 3, another tribe wants in on the medical marijuana action, a West Virginia mayor calls fro drug decriminalization, backers of Bolivia's president are using coca as campaign contributions, and more. 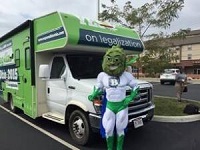 It's election day in Ohio, a big money California legalization initiative rolls out, there's another national poll with a majority for pot legalization, Ireland takes big steps toward harm reduction, Germany gets set to deal with medical marijuana, and more. Ohio's "monopoly" pot legalization initiative got trounced, two Michigan towns vote to legalize it, the Seneca Nation marches toward medical marijuana, the DEA releases its annual threat assessment, and more.